Dried cherries add a slight tartness to the bar, which is balanced by grain-sweetened chocolate chips with half the sugar of typical chocolate chips. 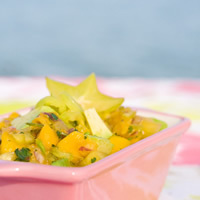 In a large bowl, combine mangoes, pineapple, avocado, red onion, cilantro, banana pepper, and ginger. Drizzle with lemon and lime juice. Serve with tortilla chips, on a salad, or as a side to complement grilled meat.